AcroYoga is the result of blending the practices and wisdom of Sports Acrobatics, Partner Yoga and Thai Massage. With the power and dynamics of the Solar side of the practice, we have fun creating beautiful flows, balances and eye catching moves. In the Lunar side we practice facilitating healing in our partners through supported flight that allows the body to melt in unique and sublime positions that promote healing. 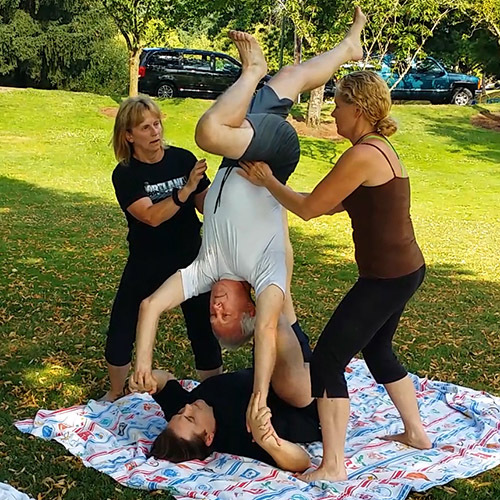 Jess and Chad are both certified AcroYoga instructors (through AcroYoga.org). We fully embrace the mission of the organization to 'build community through divine play'. Trust is the currency that we exchange in acrobatics. With this blanket of trust we become empowered and empower others. The Solar Acrobatic Practices are the tools to unlock that power in others and ourselves. The solar elements are strength building, inversions with spotting, and partner acrobatics. As we build strength by using acrobatic and gymnastic training techniques we can expand the vision of our personal power. We currently provide private instruction for individuals, couples, and small and large groupos upon request. Please email edge@edgemovementarts.com for scheduling your training! HIIT meets the wisdom of Acrobats in this explosive and fun workout! Every AYfit class begins with a partner based strength training circuit that gets the blood pumping and the sweat flowing. Rather than using weights and machines to provide resistance, we use our friends! The added benifit of the social component in your resistance training provides increased motivation, changing the focus from reps to connection and form, and results in a lot more laughter! Training in a community we learn to safely go upside down. In no time you'll have a handstand practice and understand how tightness and tone through your core provides you balance and support through the rest of your life. You will spot and be spotted, trust and be trusted, encourage and be encouraged, fail and succeed... and you'll never have more fun in any other workout! We conclude the class with fun AcroYoga poses and skills. Depending on the level of the class these can be easy beginning postures and movements, all the way up to hand balancing and standing acrobatics. With all the strength and form elements prior to this section, you will drastically improve your AcroYoga skillset and become the BadAss base and/or flyer you dream of becoming in a very short time! We love to travel! Bring us out to your community! We'll come and support your community! As travelling instructors our entire purpose is to build your community and inject new life and vitality into your students. 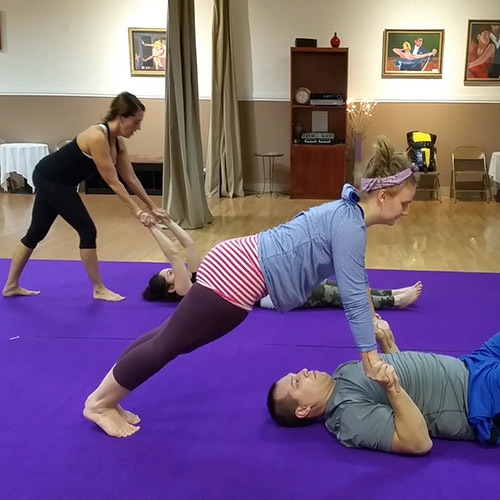 Whether you are lovingly building a new AcroYoga Kula or needing some fire and excitement for your advanced students, we have a workshop ready to bring to you! To schedule an event in your community, contact Andrea at andrea@edgemovementarts.com and we'll begin tailoring your event for your needs! This workshop is perfect for new to intermediate communities. The purpose of the event is to expose new students to the practice and offer sound and safe techniques and instruction to other beginning to intermediate practicioners. Depending on your community needs we can teach any where from one 2-3 hour, 4 events over two days, or even full week retreats and immersions. Jess and Chad are well known within the AcroYoga community for being able to blend partner dance with acrobatics. Each year at Divine Play they consistently draw 70-100+ students to their workshops, and their performances at the annual Divine Play bring down the house. 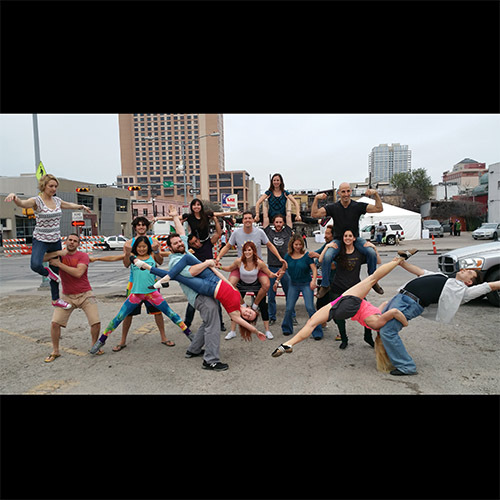 We love bringing dance lifts workshops to communities across the country, and have enjoyed having swing dancers, salsa dancers, pole dancers, gymnasts join the AcroYogi's in amazing multi-day events that result in flash mobs for unsuspecting but delighted crowds!